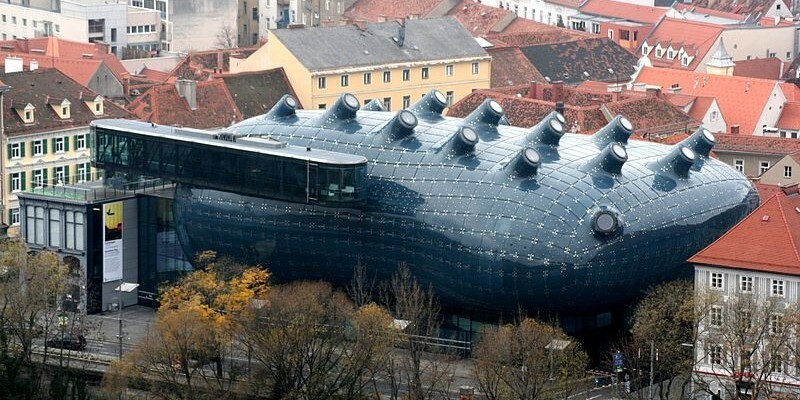 The Graz Art Museum, designed by Peter Cook and Colin Fournier in 2003, is a must see for those who can really understand the latest tendencies in contemporary art. The huge “nozzles” sticking out from the roof are in fact solar panels which enable the building to generate its own energy and make it environment-friendly. Thanks to the weird architecture and unique computerized lightning system which illuminates the building from beneath the transparent acrylic panels of the roof , the Museum reminds some supernatural creature and is sometimes even called a ‘friendly alien’. Being one of the world’s greatest exhibition venues, this highly functional and technical building meets all the requirements the most demanding modern art owners could only think of.